Target audience: Brand managers, marketing professionals, SEO specialists, PR pros, businesses, nonprofits, educators, Web publishers, journalists and anyone with a Twitter account. This article originally appeared at Moz and is republished with permission. Let’s talk turkey! How do you get more followers on Twitter? To start, put aside those quaint olden-times notions that seeking more followers is unsavory. Heck, even Twitter promotes their tools as means to quickly get more followers. Of course, the early days of Twitter were very different than today. Back then, there were all sorts of spammy ways to get followers. Perhaps it is the hangover from those days that makes people queasy when thinking of “techniques” to get followers. Nowadays, though, Twitter has clamped down hard. Spammy techniques will get you banished quickly. And most of those old grey-hat methods don’t even work: Twitter has radically limited how many people you can follow, as well as how many you can follow each hour. You might ask, why do I want more followers anyway? Twitter does little for SEO, or search engine optimization, at least not directly. Twitter is a lightweight, frictionless, and serendipitous way to engage customers. It doesn’t require an email blast or the customer actively visiting your site. Once they follow you, they’ll encounter you on their timeline during the normal course of their social experience. The little pings and pops you’ll have with them accrue tremendous value. Your follower count is a good measure of your influence, and other people see it as such. The more followers you have, the more you’ll attract, and the more you can use your influence to drive customers, conversations, and engagement. The more you are followed, the more likely you will appear in the “Who to follow” Twitter promotion on the left hand side of Twitter.com. With those in mind, let’s dive into the tactics. 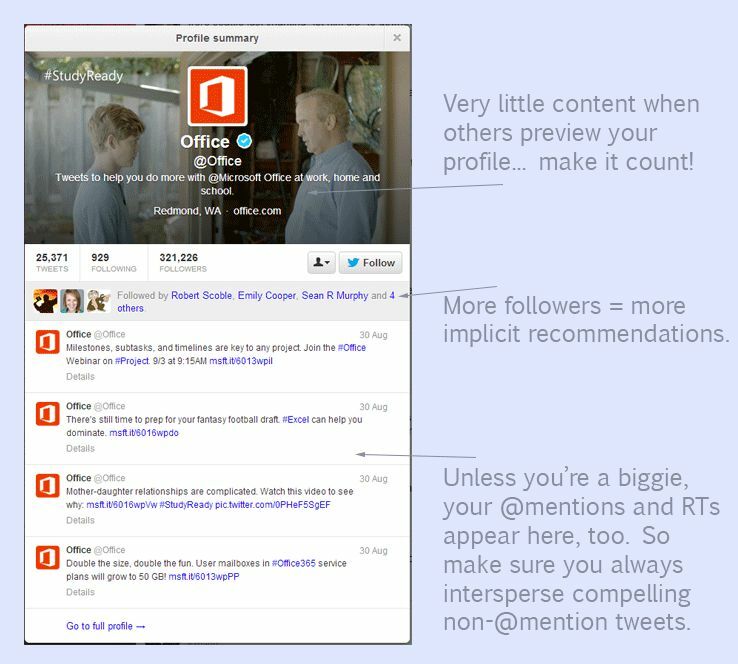 I also want to use this tips-and-tricks excursion to highlight two awesome features in Moz’s Followerwonk application. 1Followerwonk’s analysis feature helps you do exactly this. You can quickly see when your friends (people you follow) or your followers are online. 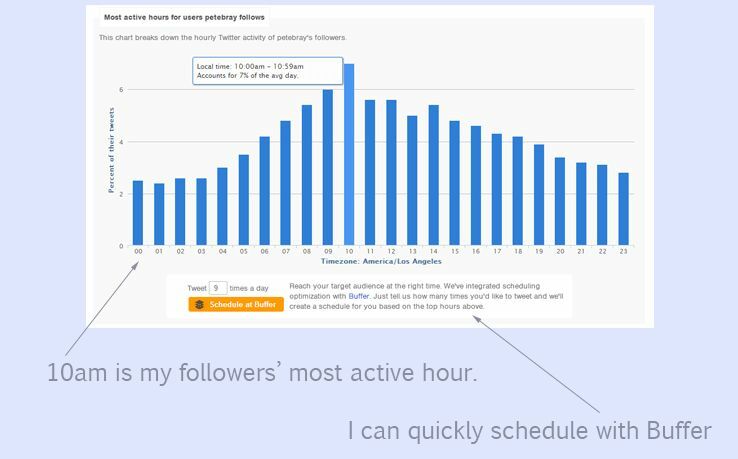 Our integration with Buffer really streamlines the process to queue tweets when your followers are fully engaged. 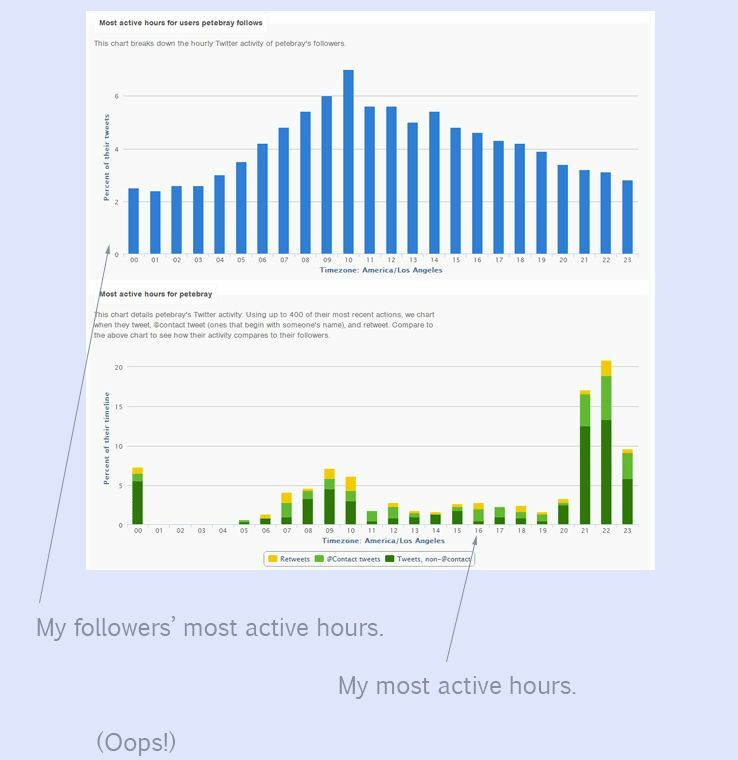 Here, we highlight when my followers are most active (top chart) with when I’m tweeting (bottom chart). (Sigh, as you can see, I do a terrible job of matching my tweets to my followers.) Do this every week or so, and try to adjust your tweeting so the two charts closely match. 2If you go to Followerwonk right now, you can search for key terms in your industry or do a comparison of competitors’ followers. Take a look at the resulting users, then sort them by Social Authority. Find those that have the highest @response rate and engage with them! This way, you can quickly search for any term in your industry and surface a list of users with different types of relationships. This is helpful when considering the type of engagement to initiate. If they follow you (and you don’t follow them), well, you can more personably address them? No relationship? Then perhaps a responsible @reply to one of their queries? In short, take advantage of the relationships you have right now. And carefully build new conversations with those you don’t. After all, the more back-and-forth engagement you have with superstars (or even semi-superstars) in your industry, the more you’ll get others in the field to follow you. 3Of course it’s not always easy to get others’ attention. But if you produce good content, you can use that as a way to start conversations with experts on Twitter. In any blog post, for example, you can directly include significant users’ tweets (or quotes or blog elements). Reach out to each of them on Twitter. Invite their comments, or solicit retweets. Did they respond or retweet? Great! Include them again in another blog post in a few weeks and repeat. 4Don’t just reply and let that end. Keep the conversation going as much as possible, particularly with positive customers. Close with a question. And with a positive response, reinforce that behavior with a retweet. And, you know what, it worked. Here’s my response. They succeeded in prompting me to continue the conversation, ricocheting their name and message around my network. 5For many, a sure sign of a spam or an otherwise suspect account are those who have a large number of followers and a large number of friends. It suggests the person’s followers are largely a result of following in anticipation of a followback. But it’s more than that. Even if you have only 100 followers, if you only follow 10, that ratio suggests you’re more compelling than those with an equal number. So, always keep an eye on your ratio. It has practical benefits, too: You won’t be able to follow over 2,000 people (not that you ever want to approach that many) unless you have a very healthy ratio. Everyone who previews you will see your four most recent tweets. Remember, @mention tweets (those where you are engaging with others) are of little value except to those with whom you’re engaging. As such, try not to exceed a string of four @mention tweets in a row. You always want a [email protected] tweet with unique, compelling content to serve as a follow-attractant to those previewing your profile. Note, too, the value of having a lot of relationships. The more you have, the more likely you will have implicit “recommendations” when someone views your profile. 7Engaging with others is a vital part of Twitter (duh). But @mentions are roadblocks to anyone viewing your profile (except the person at the other end of the mention). For third party viewers, it can be like listening to one half of a phone conversation. So, from time to time, provide strategic retweets of the person you’re engaging with as a means to provide narrative for third-parties. 8Did you know that in Followerwonk we track every person who unfollows you? Yep, we do (Pro version only). Look carefully at who you’re losing. 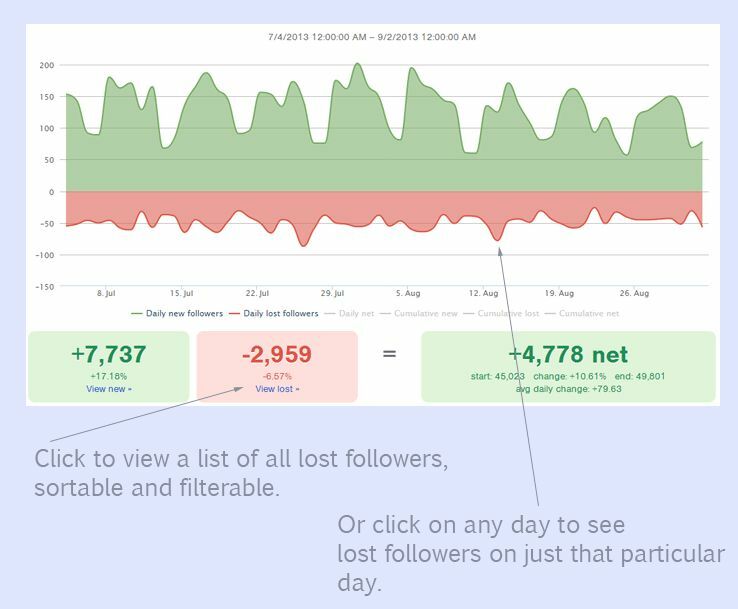 Sort the list of unfollowers by influence and follower count. Are you losing any big names? On what day? Go and look at that day and see what you did that might have driven them away. 9Remember, you want a compelling follower to friend ratio. Your default should be not to return follow, except for those whose content you’re truly interested in. These new followers are “in the bag” and there’s no value, from a follower growth perspective, in reciprocating. 10On a similar note, get rid of the dead weight that you’re probably already following right now. Do an analysis of your account. Scroll down and find the list of “recencies of tweets” of your followers and the people you’re following. Ask yourself, “why am I still following people who haven’t tweeted in 2 years?” Unfollow them. What about those tweeting in a language you don’t speak? Unfollow. Or what about those who themselves are following 1000s of people? Do you think they’re really reading your tweets? Consider them, too, as good unfollow candidates. Go to the “Sort” page where you can view all your followers. 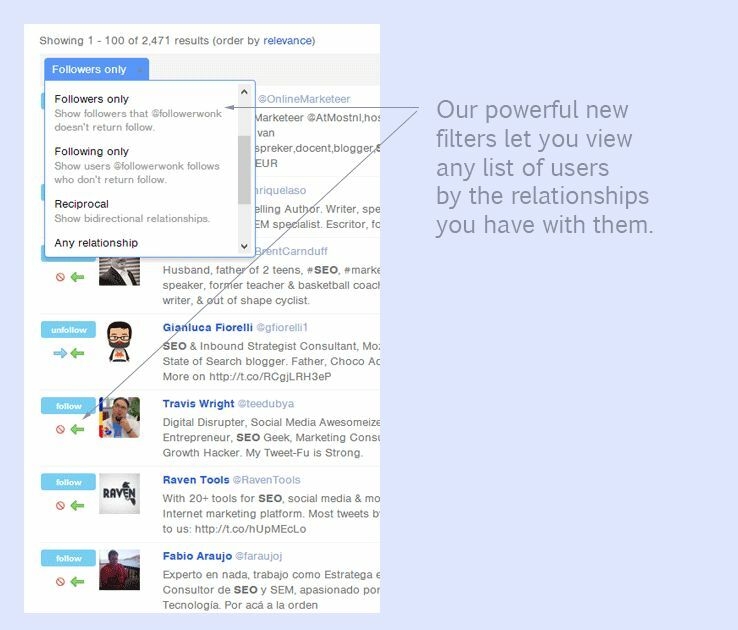 Use the awesome new filters to view those users you follow but who don’t follow you back. Are those one-directional relationships worth it? If not, unfollow them. 11You want to be part of a bright constellation of like-minded people in your industry, not part of a mishmash nebula. Why? Because Twitter’s sidebar recommendations for who to follow are very much based on groupings of interconnected people. As such, your follows should be both strategic and designed to elicit follow backs. So, go to Followerwonk. Search for your industry. Compare your competitors, and sort by influence. Don’t follow those with only a handful of friends (and who have many thousands of followers). Look for those with a relatively equal number of friends and followers. This suggests they’ll likely follow you back. Also, look for those with high engagement rates. Check their tweets. Look good? Follow them. 12Remember, most engagements with others are recorded on those users’ Twitter timelines, and those timelines (for many of us) are checked religiously. 13Just as you can track your unfollows in Followerwonk, you can also track everyone you follow (and whether they follow you back). This is great stuff. Follow a bunch of people. Two weeks later, look at those follows in Followerwonk. How many now return follow? 14So what to do about those you’ve followed who don’t return follow? Consider a targeted engagement. Take a careful look at their use of Twitter. 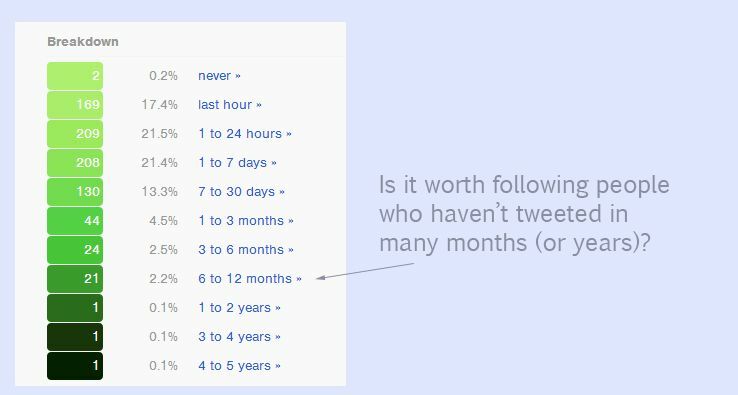 Note, in this new Followerwonk chart in our Analyze feature, how, for any user, you can quickly assess when that user is tweeting. Not only that, but we also highlight the types of tweets they’re making at certain hours. 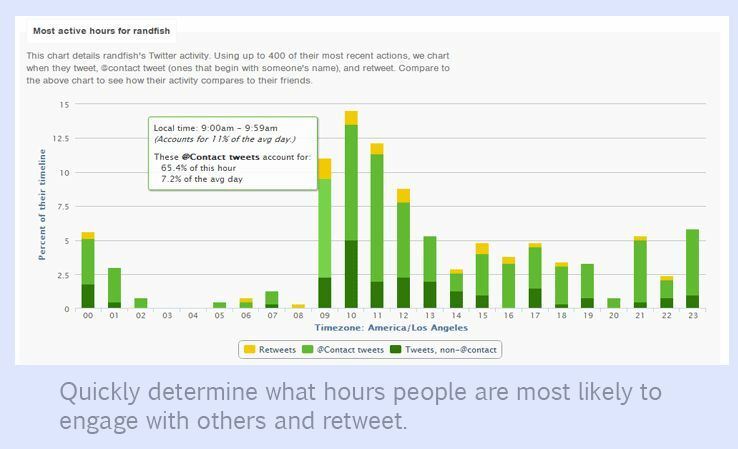 Perhaps during the early morning, for example, they’re doing most of their @mentions (a great time to reach them, then); while the afternoons are dedicated to retweets. You can use this data to help plan a campaign around especially important Twitter users, but it’s also very helpful for non-VIPs. 15Look, it’s a messy subject: the idea of following someone and then unfollowing them later. And by no means do I propose that as your bread and butter. But the simple fact is humans live on reciprocal relationships. I extend my hand, you extend yours… or else I’m gonna retract mine! As such, there’s nothing wrong with prudent unfollowing of those who don’t reciprocate your follow. But give them time, and use Followerwonk to help understand the full history of your relationship with them before you walk away. 16Make a concerted effort to generate new, unique, and compelling content on a daily basis. Don’t just sit and respond, but actively create content. There are plenty of great Chrome (and Firefox) extensions to help make tweeting a less-intrusive part of your regular web browsing experience. Use them to make generating content a natural part of your day. You’re going to attract very few followers without fresh, regular content. On the other hand, don’t go overboard. Space your tweets out, rather than clustering them all within a few minutes. (Buffer can really help you do this: we.) If you tweet more than a dozen or so times a day, you’ll risk pushing people away. 17Unless I’m sleeping, I typically will read and respond to any tweet coming my way within minutes. (Try me out!) That’s partly because all the various apps I have instantly alert me. I get emailed with @mentions, desktop alerts on Windows 8, and iPhone alerts, too. A fast response ensures that you’re catching the other person when they’ve got you on their mind. From there, it’s more likely that you’ll be able to continue the conversation. As I discussed, you want your name in circulation in Twitter as much as possible, because the more it is out there, the more others will stumble across it. I hope I’ve provided a useful summary of that research above. We’re particularly excited about the two new features that complement these relationship strategies: a new chart detailing when (and what) users tweet, and advanced filters for any list of users. Peter Bray is vice president of social strategy at Moz. He is the founder of Moz’s Followerwonk application. Follow him on Twitter at @petebray. Moz is not affil­i­ated with Socialmedia.biz and has not reviewed this trans­la­tion. Moz pro­vides the Web’s best SEO tools and resources.